But that is just the first error. Many sites have twisted and incorrectly reported key events in the sad and terrible history of involuntary servitude (chattel slavery) in North America, and the United States specifically, both as part of the British Empire and independent. Slavery, in many ways, is a key theme of understanding the history of the New World, including the Fifty States) and our institutions – not just in the Southern States. Unless we properly understand the history of this evil institution, especially in the New World, we cannot hope to avoid repeating the mistakes of the past. Susan Draper’s fairly good timeline is very detailed but has many errors. Vermont was NOT one of the Thirteen Colonies, and it was the Green Mountain Republic which began the process of ending slavery in 1777. (Vermont was claimed by New York and New Hampshire, until it was admitted as the Fourteenth State in 1791 – fourteen years later. In its constitution of 1777, the independent Republic (Vermont) manumitted slaves ONLY at age 21(for men) or age 18 (for women), unless they continued to be slaves by their own consent. There were still slaves for years in Vermont, for which reason Vermont banned transportation of slaves out of state in 1786: nine years later. Vermont probably still had legal slaves as late as 1798. While there are other mistakes in Ms. Draper’s timeline, let us go on to others. THe website “Interesting Facts” is brief, but has several errors. The first relates again to Vermont, which it states ended slavery “in 1777 after the U.S. liberated itself from Britain.” As any grade school student USED to know, US liberation did not take place until 1783 with the Treaty of Paris. And of course, Vermont was not one of the States until 1791. 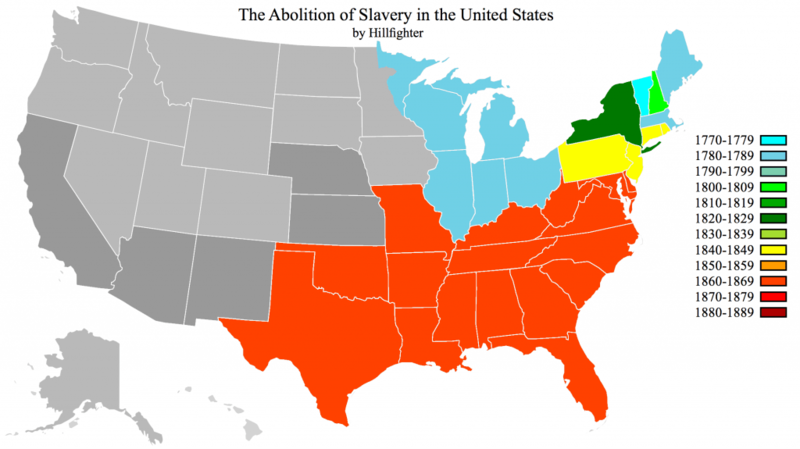 The website goes on to state, “Twenty-seven years later, all of the Northern states vowed to outlaw slavery. But slavery continued to be practiced in the North for years.” That date is 1804, and as discussed above, Massachusetts was just one of the Northern States whose “vow” was less than fervent. For example, Pennsylvania, which claims to have abolished slavery in 1780, and which Wikipedia wrongly claims was the “first act by a democracy” to end slavery, still allowed slavery as late as 1850, just “not much of it.” (Another Wikipedia article does have it more accurately.) Visit “Slave North’s” Pennsylvania page to learn the truth. We find the same falsehoods and myths perpetrated by many websites (and hardcopy) about many situations. For example, New Jersey “officially” ended slavery in 1804, but there were still legal slaves in the State until… 1865! As we can see, there are lots of errors out there. And those errors are often intentional, to blacken certain political groups, regions or states, and to promote a false understanding of history. In order to promote other political philosophies and ultimately, political and governmental power. Both Democrats and Republicans (the parties and their politicians) benefit from such errors and outright lies. For decades, the South has been denegrated by Northern States and both “conservative” and “progressive” politicians (especially from the North) as being the racist, slavery-supporting region that was the excuse for Lincoln’s war against them. “Indentured servitude” as practiced in England and the Colonies, which made poor English and all too many Scots and Irish into slaves – sometimes for life. The enslavement of AmerInd people in the United States, British and Spanish colonies, and elsewhere in the Americas. Prison (convict) labor, in which prisoners are paid little or nothing (how’s 5 cents an hour in the 21st Century sound?) for forced labor. “Useful Public Service” as practiced in Colorado and other states where conviction of minor crimes (smoking in public places, underage sale/purchase of tobacco or liquor) leads to dozens or hundreds of hours of forced labor. “Volunteer” work required of high school (and college) students for community action organizations as a prerequisite for graduation. Islamic slavery, as practiced even here in the Fifty States. Involuntary or mandatory government itself, not just taxation, is a form of slavery. The controllers may dictate only a portion of our lives, but the effect is the same: they control, by aggression and threat of aggression, the lives of billions. If our goal is liberty, we must understand its opposites, and how they came to be, were protected, and (when it has happened) how they were defeated. This entry was posted in Nathan's Rants and tagged abolition, emancipation, fake history, falsehoods, indentured servitude, Lies, Northern States, slavery, Southern States, states' rights, War between the States. Bookmark the permalink. myths and falsehoods serve as all such things do: the enhancement of the hucksters. it is obscene that those who never were slaves expect those who never owned slaves to pay them because slavery existed. ONLY in this ignorant, dumbed down caricature of a nation can such patent idiocy be mentioned, much less considered.